InMotion Hosting is an accredited member of the Better Business Bureau since June 23, 2003 and currently holds an A+ rating., and meets all the standards set down by that highly thought of organization for an online business operator. The company has also won quite a few awards; and some of them are “3 stars out of 3 stars”, from CNET as a“CNET Certified Service Provider”, “Best VPS Hosting” from VPSHostingReview.com, and of course our PLATINUM AWARD here at TopFiveAdvisor. Every employee at InMotion Hosting shares in the profits of the company, they fully understand how vitally important each and every client is. Because of that, they go out of their way making certain that you are happy with both their products and services. Second, since employees that have a stake in the operations of a firm tend to stay on the jobs for much longer periods of time, their expertise in this field is unmatched by any of their competitors. Below you find our review for the virtual private servers firm, InMotion Hosting. With each of our reviews we attempt to evaluate the company as methodically as possible, and let our readers know exactly what we think about the products and services that they provide. A very stable and consistent VPS host that offers premium hardware and network reliability. InMotion Hosting comes highly recommended by Top Five Advisor and their customers. Their entry-level VPS-1000S plan is more expensive at their standard pricing than most other VPS offers, however, this plan also includes cPanel free of charge and includes a generous amount of RAM. Save 66% off your InMotion Hosting VPS plan with our special exclusive offer. 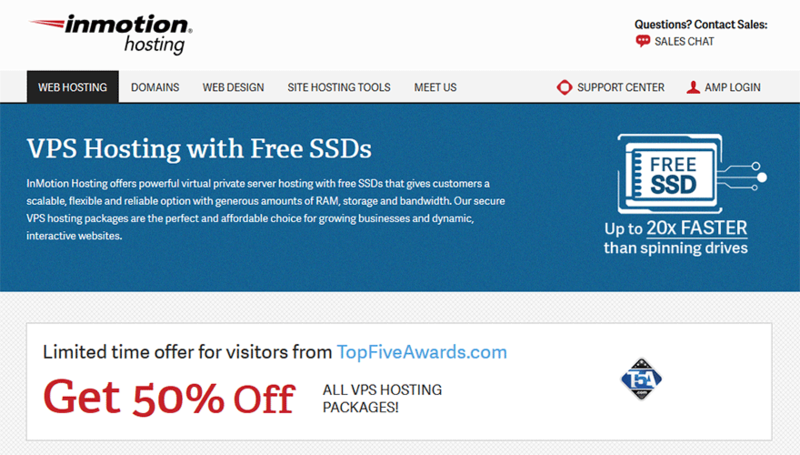 See our InMotion Hosting VPS coupon page here for the offer and claiming instructions. If you are unaware of what a VPS is or whether you need one, you may be at the wrong section for this web hosting company. If shared hosting is all you need, then be sure to check out our InMotion Hosting shared hosting review here. InMotion Hosting offers three different virtual private servers packages. Below we provide a screenshot of their current pricing and a text-based representation for the visual impaired. * Price is based on the 50% exclusive discount you’ll receive by using the TopFiveAdvisor link to order. For most customers that are simply looking for quality hosting on a non-shared server, we strongly recommend the VPS-1000S which still provides plenty of space (most sites are less than 1GB in size). If you ever need to upgrade, all it takes is a quick call or ticket and InMotion will upgrade your VPS to the next level. Feature Update: InMotion Hosting has updated all VPS plans to include a FREE upgrade to SSD, which stands for Solid State Drive. These drives boost read and I/O performance by up to 20x faster than traditional spinning hard disks that most other VPS providers offer. This is a huge value. Between all the VPS plans offered, we’ve found them all to be feature rich and larger than most of the other VPS service providers out there. The only problem with that is the standard rates you will pay after your initial discount by ordering through T5A is a sticker shock for most. As an example, the monthly rate for the VPS-1000S plan is $39.99 with prepay discounts available. Besides the obvious, what else are they offering to increase the price value here? Well, as we mentioned, they are including a free upgrade to SSD which is noticeably faster. All plans come with a 90-day money back guarantee where most offer a 30-day (if any at all). They offer free backup service (up to 10GB), allow you to host an unlimited amount of websites on your plan and even offer RAID 6, a hard drive configuration that offers ultimate reliability. Lastly, all plans come with free setup and activation for all existing and new customers. As a last testament, we currently own an InMotion Hosting VPS plan, the VPS-2000S and remain very happy with their service. InMotion Hosting offers a very impressive catalog of self help sections that will help you with your Virtual Private Server. First up is the Support Center, this area offers help via Frequently Asked Questions for anything related to your cPanel accounts from FTP settings to email management. This area offers a search box that allows you to search for whatever help you need. The next feature you should check out is the “Education Channels” area located in the Support Center. Here, you’ll find a section called “Web Host Manager” which is what cPanel calls their main administrative backend for your VPS. This section looks suspiciously small but it’s actually deceptive. If you click on “101: An Introduction to Web Hosting” you’ll find it offers 4 beginner sections within and those sections, when clicked, are massive and extremely helpful! You’ll also notice that they frequently offer video training on these pages to hand-hold you through the process. Their Support Center also includes a “Community Support” area which is a community forum that allows their customers to interact with each other. If you go there, it shows you a list of recent questions that covers all of their services, click on the “Category” button and find the cPanel and WHM links there under “Our Software and Tools.” These areas will be specific to your Virtual Private Server. Strangely enough, they sort these pages by oldest first so you’ll want to click on “End” at the bottom of the page to see the most recent topics posted. As a customer, you will have an Account Management Panel that will offers links to these sections discussed above if needed (they are public). This panel also allows you the ability to upgrade your VPS or add additional services like SSL to your server. If you can’t seem to find your answer, not to worry, they offer several ways to get in touch with them for customer support. Live Chat – This service is available for both sales questions and technical support. Their sales department is available from 8AM – Midnight EST 7 days a week. Their technical support live chat service is available all the time, 24/7 to get help anytime you need it. Phone Support – A toll-free and toll-based phone number is available to use to call them. For sales questions, they are available from 8AM – Midnight EST Monday – Friday and 9AM – 9PM EST on Saturday – Sunday. For technical support, their phone number is available 24/7. Interestingly, the phone number they provide on the upper right is clickable and uses the Skype service if you need to call from outside of the US. Email Support – A direct link to contact either their sales support or technical support departments is available. The use of forms to submit your request is not required when using their direct email. Social Media – IMH is extremely active on their Twitter account and if you click “Tweets & replies” you’ll see many responses direct to their customers. This tab is when you do an @ mention to a customer first in your tweets and shows that IMH really understands how to use social media effectively. Facebook, on the other hand, due to its format is essentially used to make announcements and report on community outreach activities. You might also find the InMotion Hosting Blog interesting. This area touts recent awards, highlights staff members and offers relevant hosting tips and advice. They offer high-performance Dell servers and use carrier grade hardware that assists these top-of-the-line servers such as routers from Cisco Systems and Brocade. Regarding the datacenters they offer, you’ll have a choice between West Coast and East Coast on the final page of the ordering process. This is essentially what they refer to as their Max Speed Zone which allows you to choose the optimal server location based on where you are when you order (GEO location). Their West Coast datacenter is located in Los Angeles, Ca through One Wilshire, known as the “most connected building” according to Wired magazine. This location has four tier-1 ISPs. Their East Coast datacenter is located in Herndon, Virginia which includes two tier-1 ISP’s. We hope this InMotion Hosting VPS review answers most of your questions about their plans and specifications. As always, we rely on actual InMotion Hosting VPS customers to let us know how their service has been. How has their customer service department treated your requests? How fast do they reply? How has phone support been? How has your VPS performed? How fast did their technicians fix your issue(s)? Leave your review and ratings below to let others know about your experiences are so far.